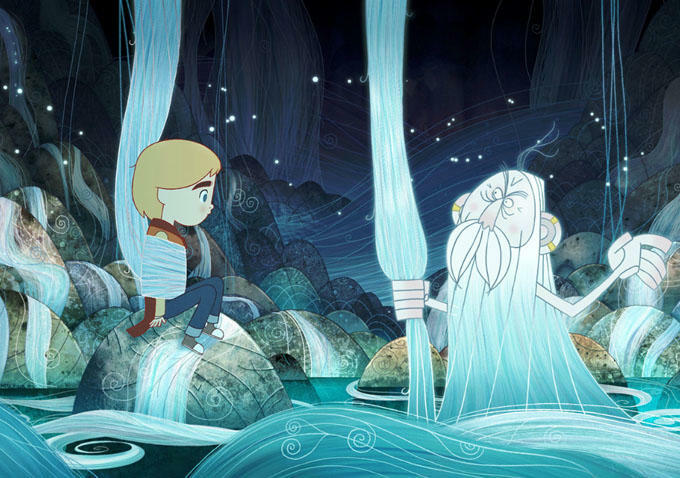 Cartoon Saloon’s beautiful Oscar-nominated follow-up to The Secret of Kells is available on DVD and Bluray today. Sarah Slade is your reviewer. We’re a Studio Ghibli kind of house. Ghibli’s gutsy heroines, surreal plots, earthy comedy and beautiful imagery have an enduring appeal that stands up to endless repeated viewing, better than Shrek and bloody Minecraft videos anyway. So when Song of the Sea came out, the reviews compared the Irish film favourably to the best of Ghibli’s output and we were intrigued. The most successful Ghibli films play with Japanese myths and legends, working them into a modern setting. Tomm Moore takes a similar approach to Irish mythology in Song of the Sea, here weaving the story of the bewitched giant Mac Lir, guardian of the path to Tír na nÓg, the Otherworld, into a modern tale of unsupportable grief, loss, repression and redemption. You know…cheerful stuff. Ben (voiced by David Rawle) and his mute sister Saoirse (Lucy O’Connell) live with their widowed father and a dog in a lighthouse on a rock off the coast of Donegal. Ben’s mother died when Saoirse was born, so Ben blames his sister for the family’s loss and is, to be frank, a little git to his sister. Saoirse is a sweet, dark-eyed girl with an unhealthy fascination for water. Their father, Conor (Brendan Gleeson) is a taciturn slab of grief who only has eyes for his daughter. When their grandmother (Fionnula Flanagan) comes to visit for Saoirse’s sixth birthday, she arrives in a cloud of exhaust fumes and disapproval, full of schemes to take the children back to live with her in the city. There’s an incident involving an aggrieved Ben and a birthday cake. He is sent to his room, Conor escapes to the pub, and Granny washes up. Saoirse, lonely and sad, discovers a seashell horn given to Ben by their mother. Ben can’t get a note out of the thing, but his little sister manages to play a simple tune that wakes up the fairy folk of Ireland (“We prefer The Other Folk. Or the sí”) sparking off an adventure that takes them through magical forests, across and under the sea and back into their father’s broken heart. That’s the plot in summary with as few spoilers as I can manage. The beauty of this film is in the visuals. The great grey eternal Irish sky that changes from calm to menacing to wildly beautiful in seconds, brought to life in with a few smudges and lines, the sinister owls, the seanchaí’s towers of hair that tell the stories of the Other folk, all turned to stone by the witch’s magic, Macha the witch, embodying every interfering granny in this and the other world, stealing emotions and storing them in jars, but most of all the Irish landscape and seascape, rendered in all its terrible beauty. It’s a children’s film, so there has to be a resolution and a moral. I’m not telling you the resolution but everybody learns that pain and sadness are part of life, but that love, bravery and kindness conquer grief and fear. And that a boy and his dog will always save the day. The Secret of Roan Inish is a favorite of mine as well. And yes, these films deserve to be seen on the big screen. Here’s hoping that future films from Tomm Moore will find their way into more theaters.